Virtual Serial Ports Driver CE creates up to 20 pure virtual serial ports in your mobile system, this results in up to 10 virtual serial ports pairs. Each pair has 2 ports that are virtually connected to each other. For other applications, virtual serial ports will be seen exactly as two real serial ports connected via virtual null-modem cable. 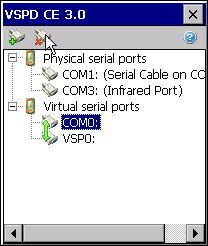 You can select any port numbers for virtual serial port pair as well as change their names from COM to VSP. For example, you can create virtual pair COM5-COM6 (or VSP0-VSP9). In this case all data sent by other applications to virtual serial port COM5 (VSP0) will arrive at virtual serial port COM6 (VSP9), and all data sent to virtual serial port COM6 will arrive at virtual serial port COM5 (VSP0). This can be seen if you run two terminal programs available for your OS and connect one of them to virtual serial port COM5 and other one to COM6. Then, all you type in first terminal will appear at second one. Of course, you can transfer files, other data or do whatever you want as if there are more real serial ports in your embedded device. With Virtual Serial Port Driver CE you can connect one application to another using virtual serial ports pair. Applications will be able to exchange data. This solution can be used, for example, for GPS simulation programs.